When an improv nerd walks into a theatre and sees UCB Theatre co-founders Matt Walsh, Matt Besser, and Ian Roberts standing in the centre of the stage, the reaction is almost physical. These are the guys, and unless you live in LA, you’ll rarely see them on stage together outside of their annual Del Close Marathon appearances. While there was an unjust supply of empty seats (which the Montreal improvisers I met in the lobby afterwards called the “Zoofest effect”), there was definitely a core group of young improv nerds with this-is-so-effing-cool looks on their faces that indicated that they knew the importance of these shows, even if the majority of Montreal didn’t. The three welcomed Horatio Sanz, Lennon Parham, Chad Carter, and Andy Daly to the stage, with Chris Gethard as the monologist. I would have much rather seen Gethard in the regular cast, and some effort made to get a non-UCB person in the monologist role. The city is teeming with comedy stars right now, so to not see that opportunity taken was a bit disappointing. From the audience suggestion of “radish”, Gethard offered up a few different stories about food, leading to first beats about a talkative customer at a restaurant, and ice cream parlour owners deciding to be mean to customers. His second set of stories about being pursued online by gay guys, and being enticed to a girl’s bedroom on the pretense of watching a movie inspired innuendo-heavy scenes, and brought back the talkative-restaurant-customer game in a scene with Parham and Sanz on a blind date. Gethard’s third story was about meeting Morrissey, and how his blog entry about it went viral (I’ll admit to having shared the link on my Facebook myself). The comments about him and his appearance were brutal, and this inspired a final batch of scenes mainly about people commenting on each other’s appearances. It seemed shorter than a typical Asssscat in New York (the show has run every Sunday night for over a decade), but nobody can really complain. Whether 100% of them knew it or not, this was the best improv that audience may ever see in Montreal. Following this was North America’s Best Comic, a show out of UCBT-LA. 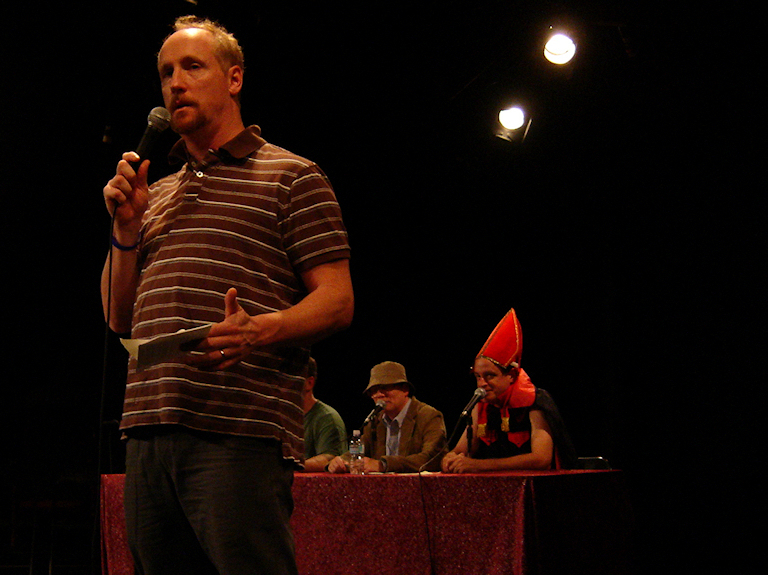 The sparse audience (sparser after the 4 walkouts in the first 10 minutes) was witness to a stream of standup characters competing for the title including Walsh as a bitter comic screwed by the industry who turned into a Christian comic, Besser as a blind and deaf guy with no arms, Parham as a washed-up divorcee, and Daly as a high-energy comic who only spews out vague references. Roberts, Daly, and Besser served as the panel of judges, with Roberts doing all too good a job as a, uh, “slow” gentleman named Leonard who was plucked from the audience to represent us on the panel. While I loved absolutely everyone involved as individuals, the standup part of me didn’t fall in love with this show. I do get that this is an exercise in character work (and it’s character work done well). And I do get that this is a parody of what became an awful, awful tv show. But there’s an ongoing perception among standups that improvisers don’t respect the art (and vice versa). Maybe it’s because I identify myself as a standup person slightly more than an improv person, but I felt like the performers didn’t have the perspective to warrant winking at the audience, which I think is necessary. The same would be true if a bunch of standups got on stage and acted like clichéd bad improvisers. You would suspect that deep down, they kinda meant it. Was it bad? No, certainly not. Did it warrant a primetime slot on Friday night? I would have rather seen Parham and Gethard have another chance to do their one-person shows, or a lengthier Asssscat in its place. It’s definitely more of a show for that late-night-at-DCM mood.